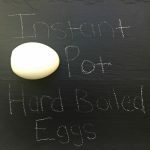 Easy to peel hard boiled eggs without the gray ring around the yolk, made in your pressure cooker. Place steamer basket* or stainless steel trivet* in the bottom of the Instant Pot. Add 1 cup of water into the bottom of the pot. Add in as many eggs as you’d like into the steamer basket or on top of the trivet (don’t fill higher than halfway full). Secure the lid and turn the sealing vent to “sealing”. Press the manual button/pressure cook button and adjust the time to 2 minutes (high pressure). Remove the lid and use tongs to place the eggs in a strainer and then run cold water over them. After that feel free to eat them or just store in the fridge until you’re ready to use them. My pressure cooker took 10 minutes to come to pressure. Then it took 2 minutes to cook. And then 10 more for the pressure to release naturally. So total time from start to finish was around 22 minutes.